When Should Businesses Make Use of Storage? There are several reasons as to why a business may need to make use of a storage facility at some point down the line. Whether it be due to moving offices, downsizing, or simply for storing infrequently used office equipment, a self-storage facility provides a clean, secure and easy-to-access space for keeping items. We discuss four common scenarios in which a company might wish to invest in a storage facility, and the associated benefits of doing so. Moving is one of the key reasons as to why companies may need to temporarily place items in storage. Perhaps you are downsizing or are relocating your business to a new premises entirely – whatever the reason may be, a business storage unit is there to make your big move a lot less stressful. Matthew James makes the process simple by arranging a suitable item collection date and packaging them securely in a container, which is then placed within our secure storage facility. The container used to store your items can then be delivered right to your new business location once you have completed the move and are ready to receive your items back! Storage units provide a great way to free up space, keeping your belongings safe, clean and free from damage whilst your office is being redecorated or is undergoing a renovation. Plastic dust coverings are often not sufficient enough to protect expensive office furniture from the perils of potential paint splatterings, whilst the people responsible for refurbishing your premises will likely be thankful for the extra space they have to move around. Storage units are a fantastic alternative way to keep seldom used items away from the office, such as annual conference equipment, seasonal goods or construction tools and machinery. You can rest assured that your items are kept in a dry, clean, safe environment until you need to access them, which means more office space. As you are probably aware, HMRC makes it a legal requirement for UK companies to keep their financial records for at least six years, which helps ensure businesses are able to produce records for inspection if necessary. As such, it makes sense for businesses, particularly large ones which produce a significant amount of documentation, to place their important documents in a secure archiving facility, freeing up space within the business premises. Having a workplace which is clean and clutter-free often results in happier, more productive employees, as well as creating a nicer impression for visitors to your premises. 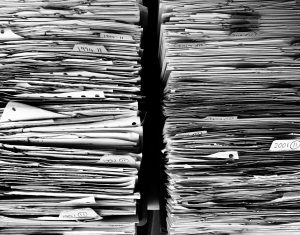 These archiving facilities can be accessed at any time by authorised employees, providing a flexible and safe way to access your documents if need be. Moreover, Matthew James is able to arrange for the documents stored within the facility to be securely destroyed once the legal retention period has surpassed. Since we care about the planet, we also guarantee that the documents are properly recycled once they have been destroyed. Storage facilities are there for your convenience, which means they can be rented out for as short or as long as necessary. They can also be accessed 24/7, only by those authorised and are kept totally secure via state-of-the-art alarm and CCTV systems, providing an excellent way to store business items. What are the Benefits of Secure Self Storage in London?